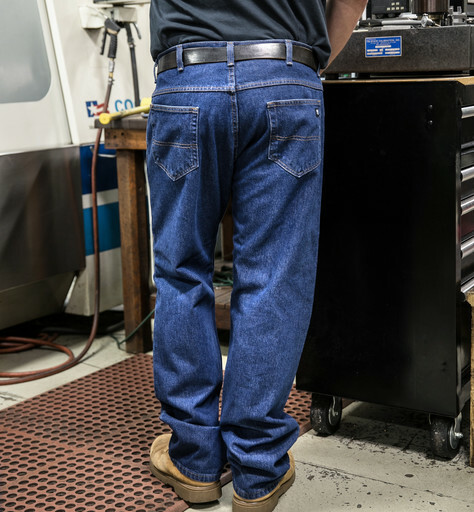 KEY Heavy Duty All Cotton 5-Pocket Jean Ready for your Toughest Day! A Comfortable KEY Jean made of 14-oz. Cotton Denim with a Soft Enzyme Washed finish. It's Classic 5-Pocket Styling includes Contrast Stitching, rivets at stress points and KEY antique brass button closure waistband. It also has Reinforced Front Pockets for Extra Durability and a Relaxed Fit Cut for Extra Comfort. These Indigo Blue KEY Jeans are Durable enough to make it thru your grueling day, yet Comfortable enough to wear on the weekends!